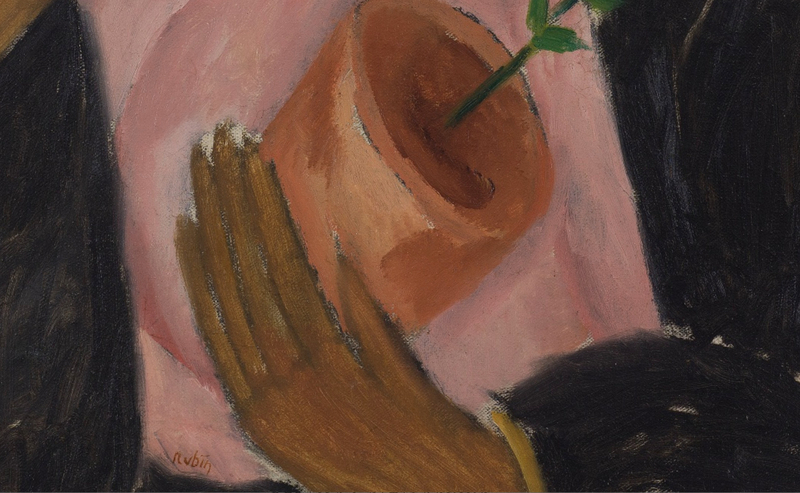 Reuven Rubin, (1893 – 1974), ARAB WOMAN WITH A POTTED PLANT (1923), signed Rubin (lower center), oil on canvas, 23 5/8 by 19 3/4 in., 60 by 50 cm, Source: Sotheby’s, detail. 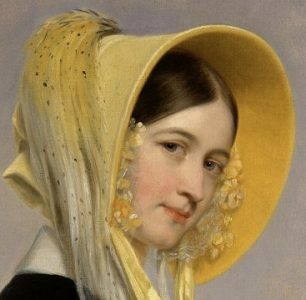 In this painting the woman’s gently tilted head is draped in a black head covering, bringing to mind Mary in her blue mantle. The sun-drenched hill behind her is like a halo that brings contrast to highlight her silhouette. Placed outdoors, holding a potted plant, the woman is in harmony with the land. 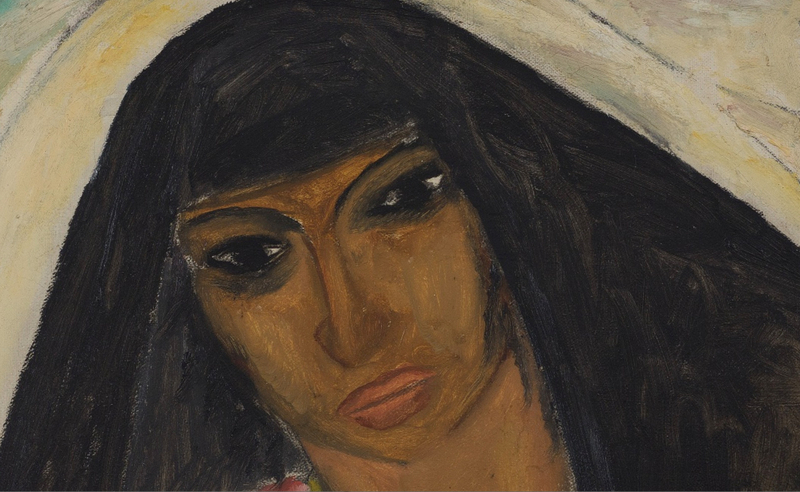 Jewish Virtual Library, Reuven Rubin, https://www.jewishvirtuallibrary.org/reuven-rubin (accessed 5 Dec 2018). 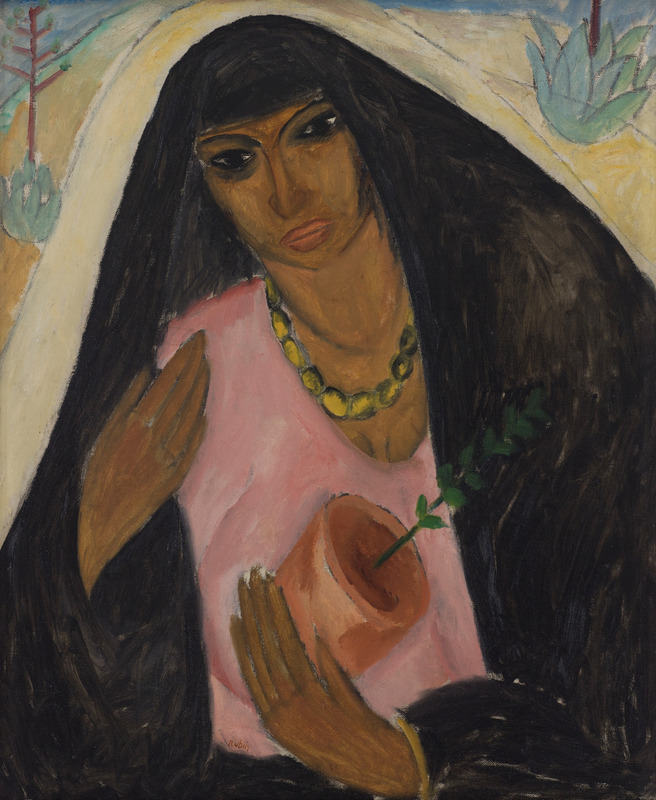 Sotheby’s, Arab Woman With a Potted Plant by Reuven Rubin, http://www.sothebys.com/en/auctions/ecatalogue/2018/israeli-international-art-n09959/lot.17.html , (accessed 5 Dec 2018). 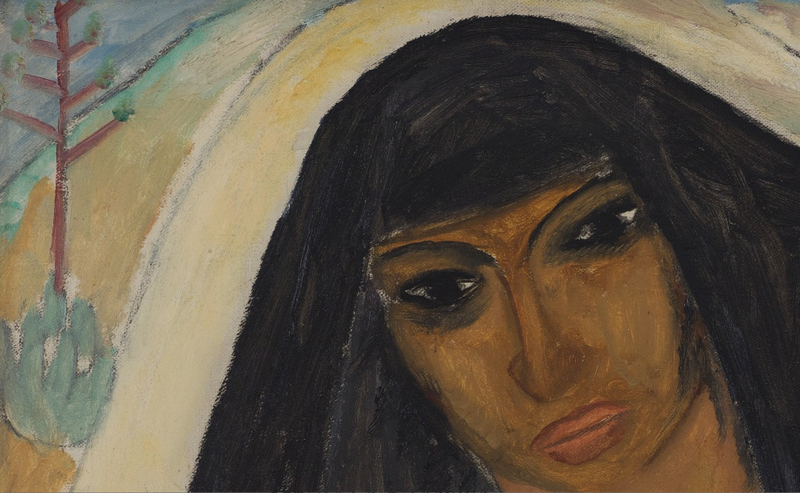 Engel Gallery, Reuven Rubin Biography, http://www.engel-art.co.il/artists.php?act=show&id=1033,(accessed 5 Dec 2018). 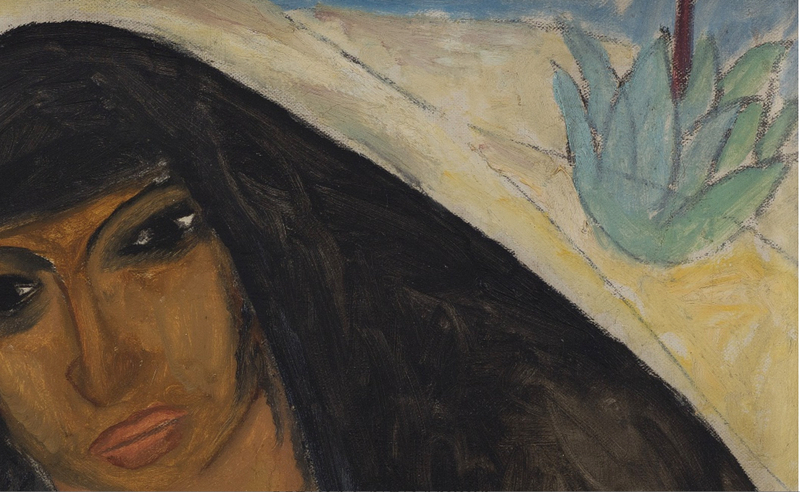 “Reuven Rubin” https://museum.imj.org.il/artcenter/newsite/en/?artist=Rubin,%20Reuven,%20Israeli,%20born%20Romania,%201893-1974 (accessed 5 Dec 2018). Wikipedia contributors, “Reuven Rubin,” Wikipedia, The Free Encyclopedia, https://en.wikipedia.org/w/index.php?title=Reuven_Rubin&oldid=868911545 (accessed December 5, 2018). 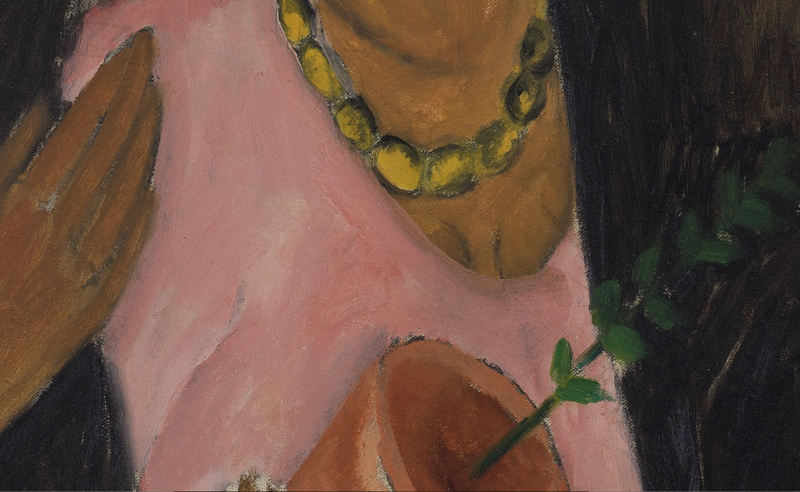 Sotheby’s quotes (Carmela Rubin, Home Visit, 1998), Arab Woman With a Potted Plant by Reuven Rubin, http://www.sothebys.com/en/auctions/ecatalogue/2018/israeli-international-art-n09959/lot.17.html , (accessed 5 Dec 2018).